Ensure your bridesmaids coordinate with your wedding theme too. 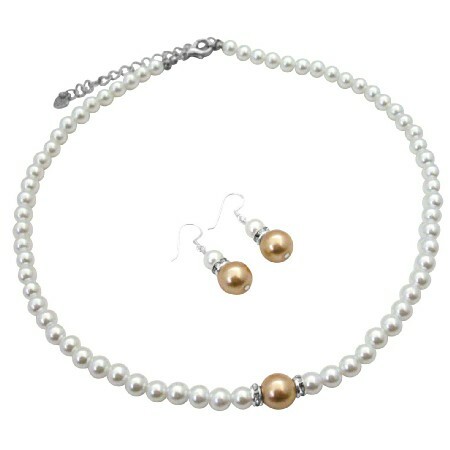 White Pearl with Harvest Gold Pearl & silver rondells spacer that sparkle will compliment your stunning white gown You are looking at a beautiful Pearl Jewelry Necklace set in adorned with white pearls & Harvest Gold pearl we can make in any color combo or color you want with sterling silver 92.5 hook earrings. Wedding Party Jewelry Absolutely Affordable Bridesmaids Bridal & Flower Girl Silver jewelry. This delicate yet elegant set that work magic as they delight the senses! A party on your Neck & ear lobes. festive.